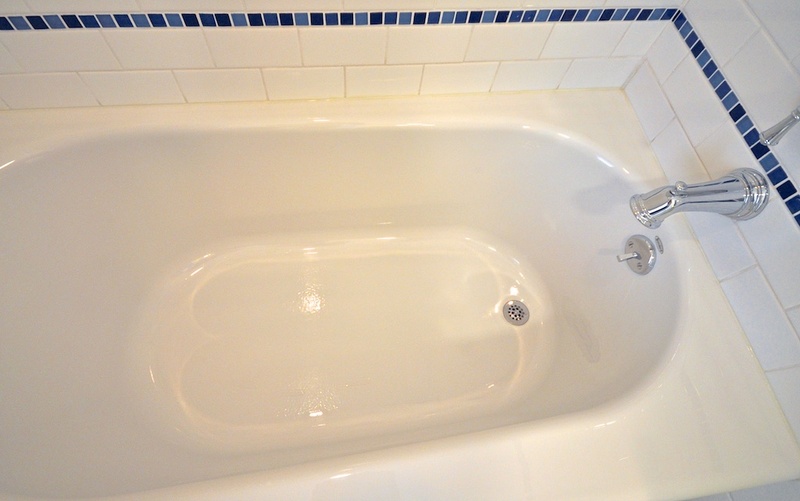 The upstairs bath has an almost identical footprint as the first floor. And we still wanted a style that was connected to the water. But we went for a fun, nautical look in this family bath - with brightly colored stripes and bold accents. We have a funky angled ceiling across the front of the house, that gave us some interesting challenges. To make the bath/shower as big as possible, we kept the shower head to the far right wall and created some nice storage on the left. It's a great place to store towels and those giant packages of toilet paper. For the floor, we used a vintage style ceramic tile - in a slightly larger, updated format. I love that old fashioned look. The vanity is a simple white, with carerra marble top, from Restoration Hardware. We had a piece of carrera cut to match for the cabinet next to the tub, providing a cohesive look. 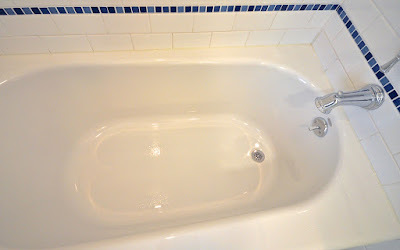 Around the tub, we installed white subway with a few rows of cobalt blue glass mosaic. The antique stool is actually a sewing caddy, with lots of cubbies under the starfish padded seat. And it gives the room one additional pop of color! 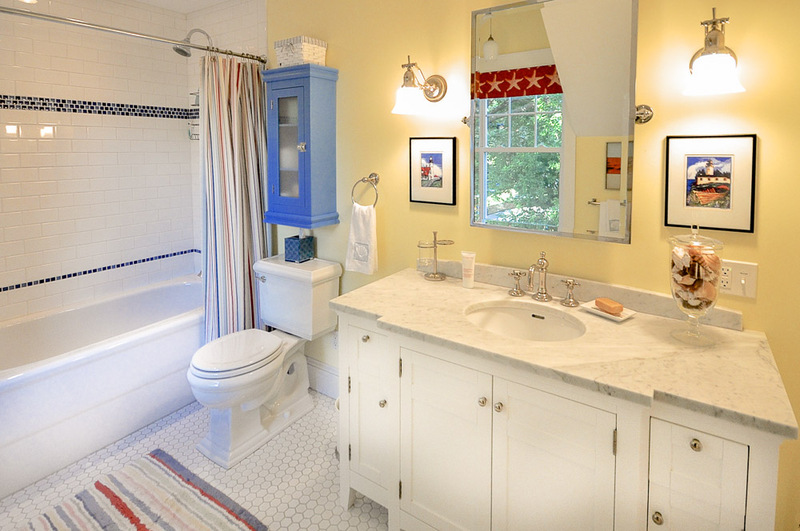 We do love this bathroom. It has plenty of counter space and storage. And we love the white, bright finishes! And like most of our rooms, when we're ready to redecorate, it will be easy to change the whole look. There is much to love in both bathrooms!! 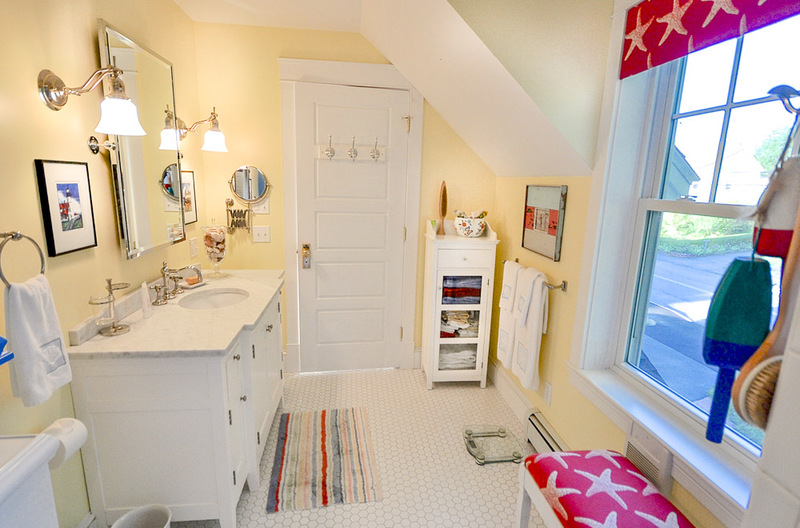 The beadboard,the colors and the vanities. Love that claw foot tub too. 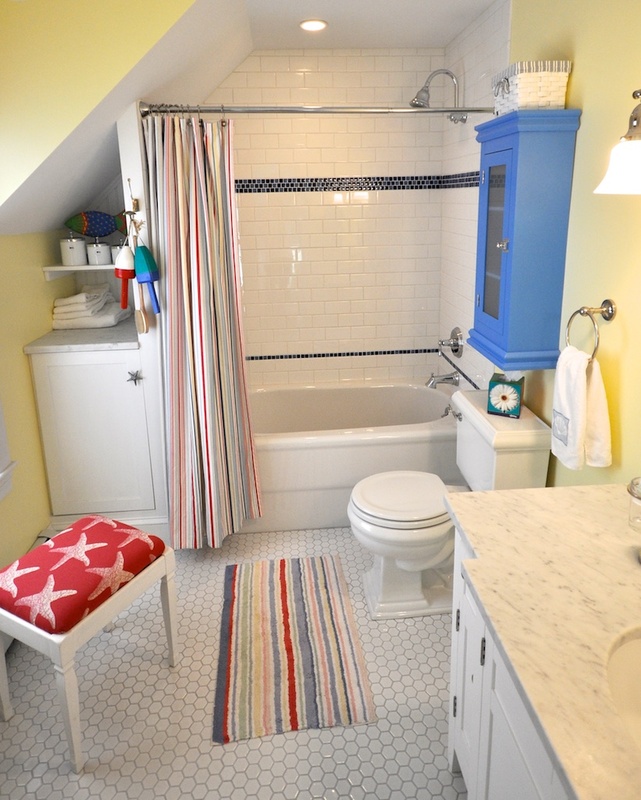 Can you tell me where you got the striped rug and shower curtain? I really like your decorating style. Thanks Pat. The bathrooms were a lot of fun! I bought the rug and shower curtain several years ago - actually before we renovated the house. And sorry, but I don't remember where at this point! But it seems like nautical stripes are always in style, so hopefully you can find something similar! hi, happen to have the wall color you used in this bathroom. your projects are all so beautiful! Sorry Robin - I had it custom mixed! I was trying to match it to the yellow stripes in the rugs and shower curtain.